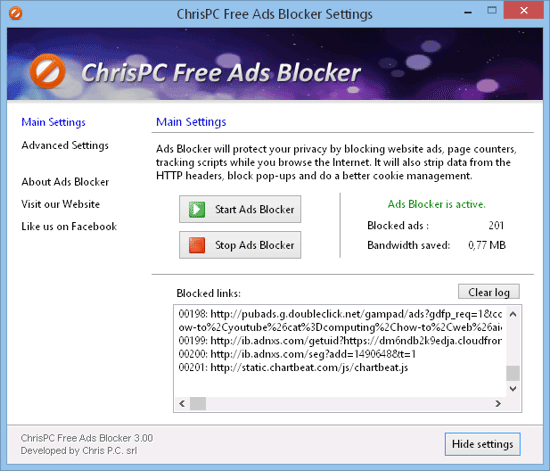 A small but powerful free software that will block all ads while you surf the Internet. Protects your privacy by blocking tracking scripts of ad networks and web counters. No more ads on YouTube! 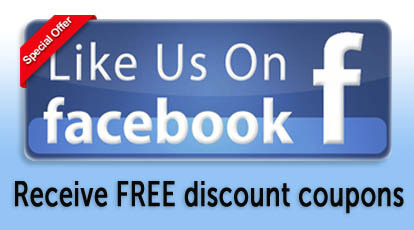 It's very simple, like us on Facebook and get your discount coupon for our products. ChrisPC Free VPN Connection lets you create a VPN (virtual private network) connection to free servers from USA, U.K., Germany, Canada, France, Germany, Russia, Singapore, Netherlands. Watch free live tv, on-demand TV shows and radio whilst overseas from: ABC, BBC iPlayer, ITV Player, STV Player, Channel 4, Channel 5, UK TV Play, FOX, CNN, ABC, CBS, NBC, Crackle, Showtime, AMC, CW and more. 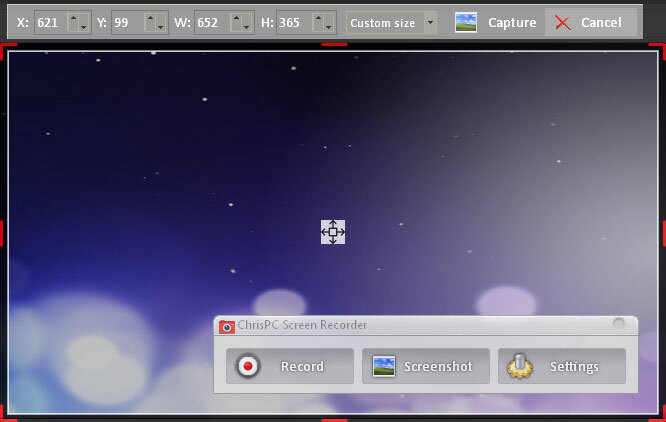 ChrisPC Screen Recorder is your perfect toolbox software to record quietly and with astonishing options your desktop screen, even when ChrisPC VideoTube Downloader cannot do the download for you. Improved Magnifier for selecting the capture area. Using VideoTube Downloader engine to download YouTube videos by up to 15x times faster! Improved YouTube video music detection. Updated converter engine to latest version. Improved video detection and download for abc.go.com, NBC, CBS, Facebook.com, Openload.co, Streamhd, Google Drive, ZDF Mediathek, ARD Mediathek, BBC, ITV, RTL, VOX, dplay.se, nrk.no, svtplay.se, svt.se, The Daily Show, Comedy Central, MTV, VH1. Improved video recording for 4k UHD, WQHD display resolutions. Added Magnifier when selecting the capture area for video recordings and screenshots. Improved support for Windows 10 version 1803. Improved support for displays with High DPI enabled on 4K displays, 3840x2160, 3840x2400 resolutions. Added recording tips, to explain the software advanced settings. Added 32 new fresh interface skin. Added support for Windows 10 version 1709. Improved video detection and download in copy/paste mode for AETV, Mylifetime, History, The Daily Show, Southpark, CMT, Comedy Central, MTV, VH1, Spike, TV Land, Nick Jr Cartoons, Logo TV, YouTube. Improved Link Finder video detection for CBC.ca, Tennis Channel Everywhere (Android mode), Tennis TV, abc.go.com, nbc.com, usanetwork.com. 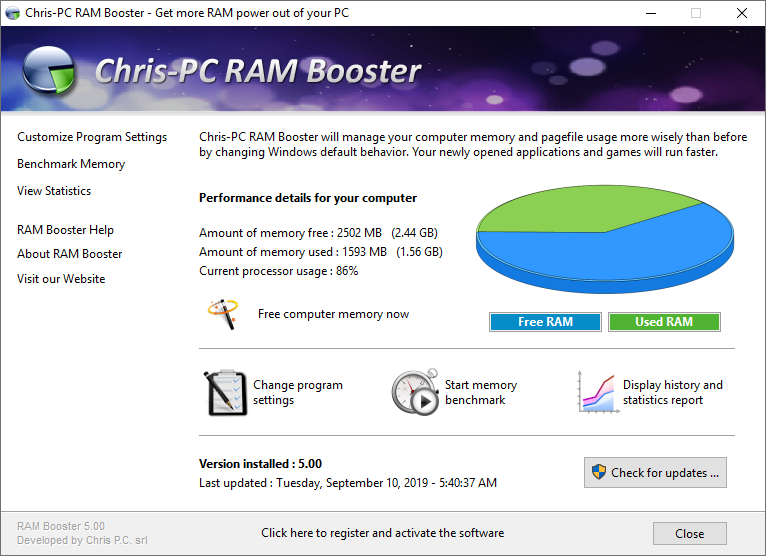 Chris-PC RAM Booster manages your computer memory and pagefile usage more wisely than before by changing Windows default behavior. Therefore applications and games will run smoother, benefiting of the full power of your computer's RAM memory. 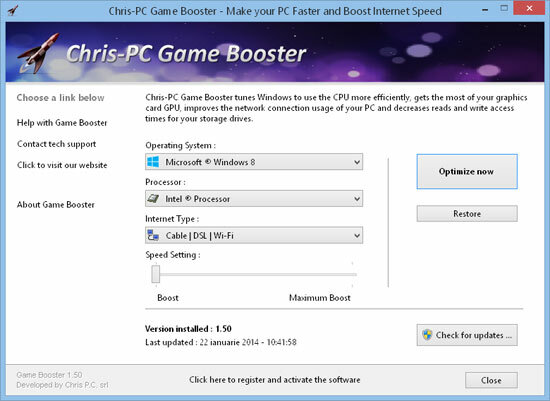 Chris-PC Game Booster is a an outstanding product of Chris P.C. srl that will rocket your PC and get its full hardware potential. Improved proxy engine with faster and safer connections using latest OpenSSL library. Improved proxy connection for USA, UK, France, Germany proxies. Updated ads blocker and privacy scripts. Added mouse highlight feature, with color and transparency settings. Added the option to play a sound on mouse click during recordings. Improved support for Windows 10 version 1607. Improved video detection and download for CBS, UKTV Play and YouTube videos. ChrisPC Win Experience Index brings back the Windows Experience Index ratings to your Windows 10 and Windows 8.1. Improved support for Windows 10 browsers. Improved and optimized connection speed for USA, Germany proxies. Version 3.00 brings a powerful feature called DNS Benchmark, that will let you easily find the fastest DNS. ChrisPC Anonymous Connection is a powerful Windows software that secures your privacy while you are connected to the internet by anonymizing all TCP/IP traffic. You do not need to make changes to the network settings of your computer or your favorite apps to protect your privacy. Just install ChrisPC Anonymous Connection, set the proxy you want to use and that is it. Of course there are advanced options like using anonymous DNS and fastest proxies. 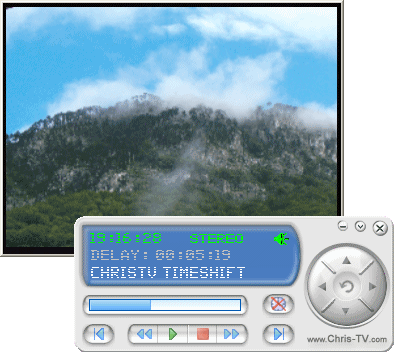 Improved video detection for CBS, CC, Syfy, CWTV, Metacafe, Vimeo, YouTube videos. Added support for Windows 10 browsers: Edge and Internet Explorer. Updated database with new ads and tracking scripts. Improved and optimized connection speed for UK, Sweden, France proxies. Fixed Windows 8 internet connection tweaks. Added Video Download History feature - keeps a log of all your downloads, helps you find downloaded videos by title, author, day of download. Added F4M HDS live stream recording. Added M3U8 HLS live stream recording. Improved detection and download for videos from MTV, CC, Colbert Report, Daily Show, New Nighnly show. Added support for the upcoming Windows 10 operating system. Improved and optimized connection speed for Germany, UK, USA proxies. Starting with version 2.00, beside our free popular award-wining ChrisPC DNS Switch, we are introducing the ChrisPC DNS Switch Pro version. The PRO version extends the customizing options of the DNS database and brings a new DNS import feature. Added support for Windows 10 Insider Preview. Improved YouTube channel video detection. Added support for Windows 10 build 10074. For users connected to the internet through a HTTPS/SOCKS proxy, there is the option to configure Anonymous Proxy to connect to the Internet through the proxy. Now you can easily verify if your browser is using the anonymous proxy, by clicking on "Check IP Address". The ads blocker comes with new supported languages: Chinese, Indian, Korean, Turkish, Vietnamese. Added support for Windows 10 preview builds. Improved proxy connection for USA, France, Germany proxies. Improved speed tweaks for Windows 8.1. Improved video detection and download for MyVideo, YouTube, RTL. Improved YouTube video detection and loading speed. Updated conversion engine to latest version. Improved proxy connection for UK and Germany proxies. Added new video streams from USA, France, UK. Improved and optimized connection speed for USA and France proxies. Improved support for Firefox and Internet Explorer. Improved video detection and download for DailyMotion, YouTube, Lifetime. ChrisPC YTD Downloader MP3 Converter is a dedicated Windows software for downloading and converting YouTube videos to high quality MP3 files. Easiness of use and speed of ChrisPC YTD Downloader MP3 Converter are its strongest points, they are really amazing, but you have to give it a try to understand what we are talking about. Improved YouTube playlist detection and loading speed. Improved internet speed tweaks for Windows 8.1. Improved and optimized connection speed for Germany, Switzerland, UK, USA proxies. Fixed proxy list download problems. Improved conversion speed for AVI and MPEG-4 videos. Fixed Windows 8.1 "Out of memory" bug. Improved and optimized connection speed for USA, UK, France proxies. Added support for Windows Technical Preview. ChrisPC Win Experience Index was tested successfully on Windows 10 build 9860 release.